During the past year it has been my privilege to share in two Services in Old Kirk Braddan – one after Christmas and the other on Palm Sunday – and my thoughts travel back to those days when clergy and people from Kirk Braddan worshipped in that building week by week. I can fully understand the desire of the Friends of Old Kirk Braddan to preserve the fabric of this church and I wish them well in the efforts they are going to make. I would also hope that very careful thought will be given as to the use of the building once it has been restored as it is evident to me that the Parochial Church Council of Braddan cannot, in these expensive days, maintain the Old Church and the present and lovely Parish Church. 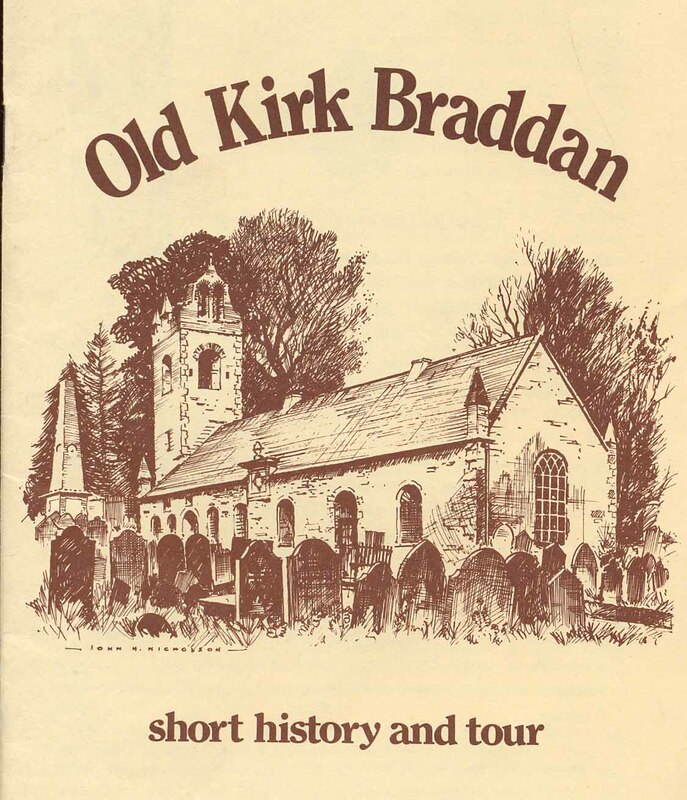 Perhaps Old Kirk Braddan can become a focus for mission and a place of pilgrimage. We must never forget that we have a responsibility to the worldwide Church and our efforts must be devoted to the extension of God's Kingdom on earth, and if Old Kirk Braddan can be a bridge to enable this to be fulfilled, then I rejoice. "IT is to be hoped that eventually every Parish in this diocese may have a Parish History". The words of Canon E. H. Stenning, Archdeacon of Man on the occasion of the bi-centenary of St. Columba's Church in Arbory. Since that time a small number of Histories have been produced and now this tiny offering is being added to the collection. It has been written by Peter Kelly and published by The Friends of Old Kirk Braddan with generous assistance of the Isle of Man Bank and Mr Cecil Clutton C.B.E. All proceeds arising from the sale of this book will go towards the appeal fund for the church's restoration. The front cover of this booklet [see image above] is taken from a sketch of the church drawn and donated by John Nicholson RI., grandson of that famous Manx Artist John Miller Nicholson who in 1892 produced a similar sketch of the old church to surmount an appeal circular for a new organ in the Parish Church. AS with all good stories it is necessary to start at the very beginning and to that end we must travel back in time to the fifth century. The conversion of the Manx is attributed to Irish Monks, most of whom were followers of St. Patrick and St. Columba. A small monastery with a timber and sod church was established on St. Patrick's Isle at Peel. Little is known of the Irish Saints. They had no chroniclers, they kept no record of events, yet they are ever memorable. The early missionaries built keeils or cells, which were not intended for large congregations, but merely for the recluse or culdee as he was called and the few who might visit him. The keeils were primitive being built with a roof of thatch or sods. It is not surprising that with the use of such indigenous materials only very few sites of these keeils are to be found. The first keeils had a narrow doorway but no windows, later ones were built of stone with a steeply pitched roof of thatch and a floor of small flat stones. They had a doorway in the west gable which was formed by two stone jambs with a flat stone lintol above. A window was placed in the east gable, this was squat and had a wooden shutter or window-door fitted on a swivel in order to exclude the elements. One such keeil is believed to have existed in Braddan. The conversion of the Manx was accomplished by Celtic preachers, but without order or method. There was no organised Church with a common form of worship or unified teaching. THE Vikings are believed to have first attacked Northumbria in 793 and these shores in 798 when they sacked the monastery on St. Patrick's Isle. Realising the position of Mann in relation to the coasts of England and Ireland the Vikings used the Island as a rendezvous and haven for their ships. The Vikings began as raiders, but during the 9th century they became conquerors and settlers. They brought with them a system of government similar to the Norman Feudal System which was previously unknown to the Manx Celts who lived and worked virtually as separate tribes with a distinction between the North and South of the Island. Officials entrusted with military, judicial or fiscal duties were granted large holdings for their support. Each lived on a portion of this estate and granted portions of it to tenant farmers, who paid for its use by doing military service and giving of their labour and produce to serve as rent. The Island was divided into six ship districts which became known as Sheadings. Each Sheading was required to build, fit and man four skeids (warships) which had 26 oarsmen. Each Sheading was divided into 26 Treens from which four men were chosen to man the ships. These Treens varied in size but always contained four farms or Quarterlands. The Norwegians were converted to Christianity by missionaries from Central Europe and from Norway the Christian revival spread back into the Norse Empire. Unlike the Celtic Church in Mann the Norse Church was organised with a keeil for each Treen. Soon after 1154 the Sheadings were divided into 'Parishes' following the Latin Parochial system. A centrally placed Treen keeil was chosen for the Parish church and enlarged. Gradually the remaining keeils, of which there was estimated to be about 193, fell into ruin. Each of the seventeen Parishes received a title, usually the name of one of the Irish Bishops or Saints of the Celtic Church. One such Saint was Brendan the Navigator, so named because of his remarkable voyages. NOTHING is known of the appearance of the first Parish Church of St. Brendan, but it was obviously of sufficient size for Bishop Mark to hold a synod there on 10th March 1291 when 35 canons were enacted. We still have today the remains of 11th and 12th century churches such as on St. Michael's Isle, Old Kirk Lonan and St. Trinians. These give us a good insight into size and mode of construction of the churches of this period. By the time we reach the 17th century many of these early churches had fallen into disrepair although some may well have been rebuilt or extended in the meantime. In 1610 Church Regulations were prepared for all Parish Churches which in addition to requiring "Registers of Christenings, Marriages, and Burials to be kept" also requested that "preparations be carefully made of the Chance and Church House upon the Glebelands within two years at the furthest and some reparations towards it in the meantime be done". In 1683 we are told of "a great indecency and disorder in all or most of the Parish Churches for want of sufficient and commendable seats." The same year an Ecclesiastical Jury was appointed to examine the Parish Church of Braddan and Bishops Court, the ancient, though now alas abandoned, residence of the Bishop of Sodor and Mann near Kirk Michael. The Jury estimated the cost of repairs to both as £31 14s. 4d. a considerable sum for those days. Bishop Wilson (Bishop 1697-1755) tells us that in 1704 the church at Braddan had been rendered, the floor flagged and a new window put in the chancel. It is also during Bishop Wilson's time that we get our first glimpse of the church for in an effort to raise money ou tside the Island he had prints prepared of all the parish churches. At a first glance they all look very similar, but a closer examination reveals the differences. Braddan had a bellcote as did all the churches, but Braddan church together with those at Marown, Malew and St. Patrick's in Peel Castle had two bells placed side by side in separate niches. Most bellcotes were finished with the masonry going to a point but Braddan and Lezayre were more geometric in their termination. The date of the print is not known, but may be assumed to be before 1704 as the walls are shown in rough stone and not render. It is hard to imagine in these ever changing days but the church was the very centre of life in those times. Offences against morality or the word of God were dealt with by punishment administered by the Ecclesiastical Courts. The most usual punishment was penance which Bishop Hildesley intended "to bring the offender to a conviction of his guilt and induce others to take warning by his fall lest they also come under the same censure". The penitent, man or woman, went to as many churches as had been ordered and stood, either at the door or inside, until they had received from the Minister a certificate saying that they had done their penance submissively. While doing it they had to wear a white sheet and be bare-headed, bare-legged and bare-footed. A woman penitent who appeared at Kirk Braddan in 1713 wearing ruffles, gloves and stockings was sent away and ordered seven days imprisonment and further penance. The vicar was shown to be not so hard-hearted when three years later a man came without the necessary sheet and was allowed to wrap himself in the altar cloth instead. For this kindness the vicar suffered, for the Bishop gave orders that the cloth was never again to be placed on the communion table and the vicar was to replace it at his own expense. Braddan was of course the Parish Church for the town of Douglas although a small chapel was built in 1641 within the town in the vicinity of what is now the Saddle Hotel on North Quay. It was dedicated to St. Mary and was subsequently replaced in 1708 by a larger chapel, St. Matthews on the site of the present cast-iron market hall on North Quay. Despite the new chapel, Braddan was experiencing difficulty in containing the congregation for on 24th February 1737 the wardens declared that "a Gallery is thought necessary to be erected in Kirk Braddan for the benefit of the inhabitants and cottage-holders of Douglas". It was agreed that two-thirds of the cost would be met by a 'Cess' or levy on the Quarterlands and the remaining cost would be met by the people of Douglas. How long it took to build we don't know, but it is interesting to note that only two months later the Wardens had "regulated the seats of this Church according to an order at Spiritual Court", their seating plan however made no reference to the gallery. When constructed the gallery would be entered by way of an external staircase such as is still to be found at Maughold and Old Kirk Marown. Even the new gallery could not keep pace with the ever-increasing population of Douglas. On 26th October 1761 a public meeting was called in the Assembly Rooms, Douglas. Presided over by the Bishop Hildesley, it was resolved that a new church should be built in Douglas. Trustees were appointed and a committee formed to collect subscriptions. An overseer was appointed to supervise the work and he was sent to Whitehaven to take drawings of a church the Committee had decided to copy. The church was to be far larger than any other and to have a large castellated tower which was hitherto unknown on the Island. This project was to proceed when funds were available and the cause was not helped by Bishop Richmond (1773-1780) who appears to have used part of the funds for other purposes. In 1775 there was a renewed drive to raise funds and we find a Committee reporting in August 1799 that £330 British was still required to complete the church. The church, which we now know as St. Georges, was finally completed and consecrated in September 1781. It was during the twenty years that St. Georges was 'abuilding' that the decision was taken to rebuild the old church at Braddan. Surprisingly very little is recorded about the building of this church. We know that in May 1773 the Vicar and Wardens made a Presentation to the Ecclesiastical Court stating that the roof and part of the gable appeared to be in a ruinous and dangerous state. The Court ordered that the church be viewed by a Jury of experienced workmen. Their decision is not preserved in any records but in November of that year the Wardens decided to raise the level of Cess to one shilling for each Quarterland and all other properties were assessed on an area basis in relation to a Quarterland. This would be to cover the cost of the works necessary. The decision was obviously not a popular one for at the following Ecclesiastical Court the Wardens claimed that no fewer than 28 persons had refused to pay their Cess and the Chaplain and Wardens of the Douglas Chapel had not yet paid their contribution. Whether repairs were started on the church and then it was decided to completely rebuild, or whether the jury recommended that the chapel was in such a dangerous state of repair that it had to be demolished we will never know. We do know that the people of Douglas had complained that the church was becoming so full that they could not use the gallery reserved for them so it is not surprising that a decision was taken to build a new and larger church. Perhaps influenced by what was taking place in Douglas it was decided to build a large western tower along with the church. The only reference we have to this is in the petition of Robert Lewin, in 1774 over the new Cess on his mill when he refers to the assessment being "for the building etc. reparation of the Church and Bellfry (it was not uncommon for towers to be given the wrong architectural term; in 1786 the vicar referred to a grave in the path betwixt the 'steeple' and west stile). Architecturally the church does not really fall into any recognisable category for the Georgian Period but then most of the Manx Churches have a style of their own, reflecting their amateur design and very limited resources. The church is built of local rubble stone much of which was probably reclaimed from the old church. There are however quoins of Foxdale granite in the tower, and the door and window jambs show samples of freestone, granite and sandstone. Scattered here and there on the stones are letters, dates and words, carved no doubt for practice by apprentice monumental masons while their master were elsewhere. There is nothing to suggest that the exterior of the church or tower was ever whitewashed as was the case with many other churches on the Island. The four corners of the building were marked by a pinnacle, an unknown feature for a Manx Church at that time, although St. Marks built only a year earlier in 1772 had similar ornamental finish to the corners and elsewhere. The church has six arched headed windows and two doors of similar proportion on the south side and six arched headed windows in the north wall, the seventh having been built up about seventy years after the completion of the church (see later). A curious feature is that both the door openings and two of the windows have dressed stone arched heads whilst all others have rubble stone voussoirs. The windows are small panes of clear glass set into carnes (strips of lead), these are not the original windows, infact they were only made and installed post war. The manufacture and pattern may be taken however, as reasonably authentic. In fact in 1836 we find the sum of £1 2s. 6d. being paid to J. Kneale for a lead window and glazing. The original windows would not have any openings as was the case with St. Georges when complained of by Richard Townley the traveller in 1791. It was not until 1855 that we find Clague and Lewin (blacksmiths) being paid £5 16s. 8½d. for 'opening windows'. These would be the hopper head openings that are still in use today. The present doors with their large locks are not the original doors but are probably those made by James Crane in 1853 for £3 1s. 10d. Above the door towards the west end is a recess that may well have once contained an engraved plaque. Nearer the other door is a white marble sundial set on a large sandstone tablet at eaves level. This is rather like a 'Mass Dial' which took the form of a vertical sundial with the hours set out as rays from the gnomon but the times of mass were carved with a deeper line. In this case the plaque with three legs and inscription in Manx reminding us that our days are but shadows is probably contemporary with the building of the church. It is interesting to note that the line of the church cannot be true east to west for the plaque has been set on a slight angle to the wall that supports it. The white marble dial complete with the words Tempus Fugit was a replacement dial carved by Robert Quaggin in 1860. The tower contains two leaded windows, one to the vestry and one to the lobby to the gallery. On the north and south faces are two narrow and small windows, each with a dressed stone heading; one rounded and the other in lancet fashion. On account of their differing styles it is probable that these were reused from a previous chapel. Above are four large arched headed openings rather like those louvred openings in the bellfry of St. George's tower. It is possible that the intention was for the bells to be mounted in this area, but instead a virtual replica of the old bellcote was built up as an east gable to the tower, perhaps in an effort to appease parishioners on the loss of the old church. On the back of the bellcote red clay bricks have been built- in to form the date 1774 which would be the date the tower was completed and would be consistent with the church rebuilding commencing in 1773. The west gable of the tower is finished with two corner pinnacles and a centre one set at the top of a masonry pediment. The north and south gables follow the same pattern but this is interrupted by the return walls of the bellcote. If this tower was intended originally to be like the ill-proportioned tower of St. Georges, then a low pitched slate roof would have been installed between the arched openings and decorative top. A photograph taken of the church in the mid-1860's shows the arched openings built up to the spring of the arch; this may have something to do with the fact that in 1859 a flat roof with lead covering was placed in the tower at a cost of £15. 7s. 9½d. Whatever roof was there before was obviously in a very poor state of repair for water had penetrated the tower and rotted the vestry floor. By 1891 the lead work was perished and was again letting water into the building. There are two bells; a treble which has a diameter of 17 7/8ths and has the letter W incised lightly on the west side and a tenor which has a diameter of 23 11/16ths and bears the date 1780 on the east side of the shoulder. This large bell presented a problem in 1848 when it was found necessary to take it down to repair it, a new chain was added at the same time. The bell ropes originally passed through the lead roof and the floor to the gallery lobby and down to the vestry. The slate roof is supported by a series of King Post and Collar trusses which are fastened together not with nails but with wooden pegs. The roof slates seem to have presented a regular maintenance problem in fact in 1851 the Wardens instructed John Robinson, a local architect, to inspect the roof. He recommended that the roof be completely stripped of slates, the rotten rafters spliced, the south elevation of the roof be re-slated with new slates and the north side be slated with the best of slates salvaged from the old roof. The most interesting and important thing about the roof line is the finial on the east gable. This takes the form of a crucifix and cross carved on either side of a piece of gneissose rock. It is believed to have come from one of the earliest churches on the site and was certainly incorporated in the previous church as it appears on the print authorised by Bishop Wilson. The crucifix is rather interesting being flanked by Maltese Crosses and the figure of Christ, carved with such details as fingers, the nails in the hands and the crown of thorns. Unlike the exterior, the interior does fall into a definable class, – 'an auditory church', that is to say it is a single rectangular room with no screen, arcades or transept. The church has that distinct, almost puritanical, Georgian atmosphere and one of the few that have become known as 'the churches the Victorians forgot' – no Milton tiles, harsh stained glass or other Gothickisms added to improve the spiritual thought. On entering the church one's eyes are immediately attracted to the east end where almost a third the wall is taken up by the east window with its intersecting Y-tracery. Either side of this window we find the Decalogue (the Ten Commandments, the Creed and the Our Father) on painted boards, many times varnished over. The present altar table is not the original one, nor the one made by William Creer at a cost of £1. 5s. 7½d. in 1836. Immediately behind the altar the wainscotting (timber boarding) differs in style from that in the rest of the chancel. The fact that it is so much plainer would suggest that the original altar either had a gradine or backdrop of curtaining or other drapery to enhance the area. The panelling in the chancel is a plain fielded panel capped with symmetrical fret work and ogee mouldings. The panelling within the window reveals appears to be a later modification. The panelling contains timber pilasters either side of the east window and again just after the the first window on each side of the chancel. A careful inspection of the moulding at these two latter points will reveal that at one time the panelling stopped here and was subsequently extended. The placing of the large monument on the north wall necessitated the blocking up of the window immediately opposite the door. We know therefore that as the monument was not placed there until 1843 or after, the wainscotting could not have been in this position until a later date as otherwise it would have passed in front of the window. The wall behind the panelling in the location of the window has infact been plastered and painted which would suggest the panelling is somewhat later. The monument opposite appeared during or after 1859 so perhaps Mr Quiggin's account for timber for the new seats etc. in 1860 relates to the extensions to the panelling. The altar rails are a strange and curious affair, those running across the sanctuary step are straight forward, but rather heavy balusters, yet on the return on the north side they have become like pilasters against the solid back of the chancel pew. On the south side the box pew frontal forms the rail. The pulpit is a true Georgian Three Decker, the lower box was for the Parish Clerk, the intermediate box for a curate or the vicar when reading or praying, and the upper level for preaching. Such pulpits were mainly necessitated by the introduction of box pews which through their height required the pulpit to be even higher. The Reformation resulted in less emphasis on the altar and more on preaching and reading, with the result that sermons became the rival of the sacraments and the pulpit became the most conspicuous piece of furniture in church. The box pews have probably graced the church from its completion as we know St. Mark's, which was completed in 1772, had box pews and a triple decker pulpit. The hinges to the pew doors are of an H type as is the case with the pulpit, but the box pews around the chancel have a butterfly type of hinge which was a later design. Each pew had a wooden draw bolt except those in the chancel which had a mortice lock. On the wall around the church are two rows of wooden hat and coat hooks. The chancel floor comprises headstones of Pooilvaish or Scarlett limestone. The inscriptions are now almost worn away. The name of John Curphey, Vicar of Braddan 1704-1733 can still be discerned. Many of these burials took place whilst the old church was in use and would take the form of a brick vault with the limestone slab top. Between the slabs and pews a row of bricks similar to those used to form the date on the tower have been inserted. The remainder of the floor back to the stepped timber floor under the gallery was flagged with similar limestone in 1839. The two small porches do not appear to be original, in fact the easterly porch has a gable made out of an old door which still retains its hinges and lock. The roof to this porch is hinged so as to be opened for ventilation when the outer doors are open, but the inner doors closed to prevent the parson's sheep from entering the church during service. The western porch has had its inner doors removed and its ceiling is perforated for ventilation. The gallery at first glance looks strange with its two Bressumer Beams (the full length beam supporting the gallery front) but here the answer lies in the continual increase in population resulting in Richard Cowie being employed to extend the gallery in 1861 at a cost of £24 4s. 6¼d. It is more than likely that the original gallery front was re-erected in the new position. Around the walls of the church are several monuments, mainly plain and simple, but two fine white marble monuments that would do justice to any cathedral are to be found either side of the chancel. The larger is erected to the memory of the Honourable Richard Murray, son of Lord Henry Murray (5th son of the 4th Duke of Athol). Surmounted by cannon, flags, drums etc. it reflects no doubt his service as Lieutenant Colonel in the Coldstream Guards at sometime with the Duke of Wellington. This monument was carved by C. M. Seddon of Liverpool. Seddon flourished from 1824 to 1858 and was an exhibitor at the Liverpool Academy; his work is to be found not only in Liverpool, but also as far afield as Shrewsbury. On the opposite wall we find the monument of Margaret Tennison Murray his daughter. Here the sculptor is J. S. Farley of 181, Coswell Road, London whose work is to be found mainly in the cemeteries of London. He carried out business from number 12 Coswell Road from 1850 to 1863 and from number 181 for the following three years. It would appear therefore that the monument was not erected until at least four years after Miss Murray's death. There are ten memorials in all, only one other bearing the name of the sculptor. That is the memorial to Joseph Lovell who drowned near Bristol; this was carved by T. Quilliam of Castletown who, in addition to being a monumental mason, was the largest manufacturer and purveyor of Pooilvaish 'marble' fire surrounds. Space does not permit a description of each memorial, but the reader would do well to visit the church and view them. Tucked away in the north west corner of the church we find the font; one of the few wall fonts left on the Island. This granite piece may well have come from the previous or even earlier churches, we don't know. Certainly its plug hole and vanitory unit-like top are far from original. It is not even known if this was its original position in the church for we find that in 1854 Charles Swinnerton was paid £1 6s. 0d, for re-setting the font. On the north wall of the church externally and immediately in line with the font we find a timber lintol and a built-up opening suggesting that this may at one time have been a door or window in the wall. No explanation can be found for the curiously fashioned jamb to the window opposite – was this the original font position? Leading off the west gable of the church is the Vestry. Formed out of the lower storey of the tower it shows signs of its window having had its cill level raised at some time. In the west wall of this small room is to be found a most unusual wall safe. A burglary did intact occur in the church in 1816 when between thirty and forty shillings that had been collected for the poor was stolen. The safe bears the date 1817 (a case of bolting the door after the horse had fled) and is reputed to have been made by members of the Carooin family, blacksmiths of The Strang. William Cubbon, a former curator of the Manx Museum was of the opinion that the safe had a very clever and secure mechanism. He also felt the initials on its face (H.W.C., T.C. and V.C.) were members of the family who worked on it. The other initials (T.H.) were surely those of Thomas Howard who was vicar 1810-1836. Before leaving the church, we must comment on the things that are not there. Firstly, there is no electricity, lighting would be by rush light and then oil lamp. Secondly, whilst there are no heating appliances now, there were formerly a stove in the chancel and one close to the western door. In fact in 1852 it cost £12 8s 1¾d to purchase and set up the stoves. Finally, whilst there is no organ in the church at present. its first one appeared in 1837 having been made, donated and fitted up by Mr Dale of Leece Lodge. This was by no means the first organ to be used in church on the Island, but it is interesting to note the newspaper reporter's comments that this great improvement would probably lead to the general adoption of such instruments in the Manx Parish Churches. A later organ was transferred to the new church in 1876 and then to St. Lukes Baldwin in 1894. It was subsequently replaced at St. Lukes in 1914. Like most other Manx Parish Churches, Kirk Braddan has its own collection of Runic Crosses. Not all were found in the churchyard, some were found elsewhere in the parish and of those found in the graveyard some had been put to other uses. The crosses have now been placed together immediately opposite the principal entrance to the church; each cross has a metal number attached (10 in all) and a description of each is given on two boards by the crosses. In 1855 when Mr Kinley was working on the 'steeple' (sic) one such cross was found acting as a lintol over one of the doors. It was rescued by Mr George Borrow (author of The Bible in Spain) and its inscription translated "Otta erected this cross to his father Frakka, but Tharbjoin son of (name illegible) made it. Another cross (No. 112) was found acting as a step to the entrance door. On this one the inscription reads 'Thor erected this cross to Ofeig Klinaison' and it is known as the Thorsteus Cross. The fragmented cross (No. 146) was found by William Cubbon in 1920 built into the church yard wall; the second one to be found in the wall. One cross that attracts a lot of attention is No. 135 known as Thorleif's Cross. The runic inscription reads 'Thorleif Hnakki erected this cross to the memory of Fiaco his son, the nephew of Eabor'. This cross was used as the model for the Braddan War Memorial which now stands in the grounds of the present Parish Church. Churchyards are fascinating places and a whole book could be de- voted to the inscriptions, the personalities and the folklore attached to those in Kirk Braddan. Jefferies in his Tour of 1809 referring to funerals says '... and the solemnity of the whole ceremony, at Kirk Braddan in particular, is heightened by the impressive silence and deep gloom of the surrounding scenery. Most of the memorials, however, record little more of the buried person than that he was born on one day and died upon another, the whole history of his life being comprehendedin these two circumstances whic h are common to all mankind'. Towards the top of the slight incline is a red sandstone monument rather like a short obelisk with pedimented top, to the memory of Captain Edward Quayle, the second Commodore in the service of the Isle of Man Steam Packet Company. His monument was erected by friends and was carved by Charles Swinnerton who within one of the pediments included a carving of the Steam Packet ship Douglas I. The first Captain and Commodore of the Steam Packet, Captain William Gill lies a little closer to the path running to the church. It was he who discovered the Victoria Channel into the port of Liverpool. Just behind the church where the east gable meets the north wall we find the resting place of Rev. Philip Moore, Chaplain and School Master at Douglas. Note here a text has been removed at a later date and a reference to the Duke of Athol inserted. Perhaps the most outstanding monument is that to Lord Henry Murray, the 5th son of John 4th Duke of Athol. It takes the form of a large obelisk of Arran stone (possibly stone left over from the completion of the Castle Mona). On one face of the Obelisk is a three legs plaque; this is not carved in stone, but is a cast artifical stone known as a Coade Stone after its manufacturer Mrs Coade of London. She commenced the production of this artificial stone in 1769 and in 1799 took John Sealy into partnership. From that time until John Sealy's death in 1813 the firm was known as Coade and Sealy and it is that name which appears on the face of the three legs plaque. Other Coade plaques on the Island are to be found at The Castle Mona and Ramsey Court House (alas now highly painted). Close to the obelisk lie the remains of Henry Hutchinson, brother-in-law of Wordsworth whom we are told penned the inscription on the headstone. On the opposite side of the fath lies Rev. Matthew Gahan a Jesuit Priest from the Catholic Chape in Douglas. Nearer the tower door the altar tomb of Elizabeth Redfern has a cast iron plaque attached; this depicts a human heart held in the palm of a hand. Closely and adjoining the boundary wall we find what is probably the Island's only cast iron tomb from which unfortunately the marble plaques have fallen. In the south west corner we find Rev. Robert Brown, Vicar of Braddan 1836-1847 and father of the famous Manx Poet T. E. Brown. Nearby is Robert Quayle who died in 1809 after being Vicar for 18 years. On the south wall are the tombs of the Drinkwater family who gave part of their grounds in 1935 to become a private burial in a crescent shape just a little further down the south wall. Perhaps the most famous grave in Braddan Churchyard is that of a young coloured boy Samuel Ally who died in 1822 at the age of 18 years. He was born a slave who "repaid the boon of liberty with unbounded attachment". The touching epitaph was written by Colonel Mark Wilks of Kirby (the large house in the grounds next to the churchyard) who had brought Samuel Ally back to the Island from St. Helena where Col. Wilks was Governor at the time of Napoleon's arrival. By order of His Excellency the Lieutenant Governor under Section 6 of the Burials Act 1881 and signed on 8th February 1921 the Vicar and Wardens were ordered to discontinue burials in the churchyard. Headstones apart, Braddan Churchyard was for many years probably the most famous churchyard in the British Isles. It was on June 29th 1856 when the Bishop having decided to visit the church was taking Morning Service, a message was passed to him advising that there were as many people in the churchyard as in the church. The Bishop obliged by going out into the churchyard to preach. From that day the Vicar continued the practice during the summer season. By 1913 the crowds were so great that the service was transferred to the field behind the new church. In the minutes of a Vestry Meeting held on 25th March 1869 we find the words "The old church has long been felt inconveniently small to the requirements of the Parish, and from age and decay is incapable of satisfactory improvement or enlargement". A resolution was passed to build a new church close-by which was subsequently consecrated on 31st August, 1876. We note with interest, however, the final words of those Vestry Minutes: "It may be well to mention here that the old Church is a picturesque object, and has long been a favourite resort of visitors, it is intended to let it remain precisely as it is." Picturesque as it is, the Church is now showing signs of age, and requires vast sums of money to be spent on it. The formation of The Friends of Old Kirk Braddan in 1982 hopefully will result in its salvation from the ravages of decay. You, the reader, can also help by remembering the words of John Betjeman the Poet Laureate "The greatest protection for any building is love". Please show your love and affection by making a donation to the Restoration Fund or by joining The Friends of Old Kirk Braddan.